The S&P 500 fell as much as 2.5 percent to 2,530.54, surpassing its February intraday low of 2,532.69. The broad market index finished the session down 2 percent at 2,545.94, its lowest close for the year. The Dow Jones Industrial Average lost 507.53 points to close at 23,592.98, bringing its two-day losses to more than 1,000 points. Shares of Amazon and Goldman Sachs led the declines. The Dow and S&P 500, which are both in corrections, are on track for their worst December performance since the Great Depression in 1931, down more than 7 percent so far for the month. The S&P 500 is now in the red for 2018 by 4 percent. The tech-heavy Nasdaq Composite dropped 2.2 percent to finish the day at 6,753.73 as Microsoft dropped 2.9 percent. The Russell 2000 — which tracks the performance of smaller companies — entered a bear market, down 20 percent from its 52-week high. DoubleLine Capital CEO Jeffrey Gundlach said Monday that he "absolutely" believes the S&P 500 will go below the lows that the index hit early in 2018. "I'm pretty sure this is a bear market," Gundlach told Scott Wapner on CNBC's "Halftime Report. The major averages fell to session lows following his comments. All 30 stocks in the Dow and all 11 sectors in the S&P 500 posted losses on Monday. The Cboe Volatility Index — one of Wall Street's favorite gauges of market fear — rose above 25 and volume for the stock market was heavier than usual. The Fed is expected to hike its benchmark overnight lending rate for a fourth and final time of 2018 on Wednesday. While fears of rising interest rates and an ambitious central bank have spooked markets throughout 2018, such concerns have heightened over the past month as inflation and growth expectations recede. President Trump doubled down on his criticism of the Fed's rate hiking path on Monday, lambasting the central bank for "even considering" another rate hike just days before its final meeting of the year. "With just ten trading sessions left for stocks in 2018 the chance of a Santa Claus rally appears less than slim," John Stoltzfus, chief investment strategist at Oppenheimer Asset Management, wrote Monday. "Sentiment remains sour toward stocks even as fundamentals and relatively cheap valuations leave stocks poised to move higher in the New Year." Recent economic data have reignited worries of economic slowdown around the globe and kept a lid on stock returns. Homebuilder sentiment fell to its lowest level since May 2015 in December as potential buyers delay purchasing new homes despite a pullback in mortgage rates in the past month. Sentiment declined four points in December to 56, well below December 2017's print of 74, according to the National Association of Home Builders/Wells Fargo Housing Market Index, released Monday. New York manufacturers reported on Monday that business activity is still expanding, but growth slower much more than expected in December. The Empire State Manufacturing Survey's general business conditions index, aggregated by the Federal Reserve Bank of New York, fell to 10.9 from 23.3 in November, falling short the 20.6 print expected by economists polled by Refinitiv. 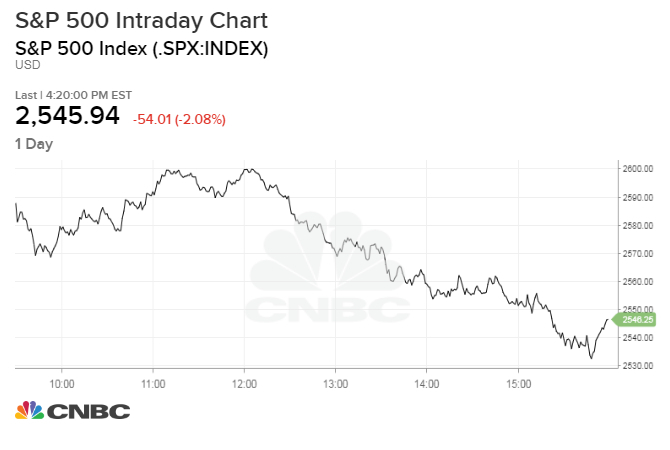 The Dow fell nearly 500 points and the S&P 500 closed down 1.9 percent on Friday to 2,599.95 after China reported industrial output and retail sales growth numbers for November that missed expectations. Shares of Goldman Sachs fell 2.7 percent Monday after Malaysian authorities filed criminal charges against the bank and two former partners in connection with the 1MDB financial scandal. The company is under fire for its role in helping raise $6.5 billion through three bond offerings for 1Malaysia Development Bhd (1MDB), which is the subject of investigations in at least six countries. Tech favorites of the bull market got hit hard on Monday with Amazon losing more than 4 percent. Alphabet tanked by 2 percent. Very few stocks and sectors gained on Monday, even defensive utilities and staples were mostly in the red. — CNBC's Michael Sheetz and Gina Francolla contributed reporting.